I love tea. I grew up in a household where my nan (grandmother) would brew a pot on the half hour. I even had tea in a bottle when I was toddler. We didn’t seem to have any allegiances to any particular brand, but when I was little I remember we had PG Tips. I used to collect the special cards that they included in the boxes. Sometime in the eighties I think we moved over to Tetley. I began experimenting with different types of tea in my teens. Some of it came from The Tea House, a lovely shop in Neal Street, Covent Garden, London. 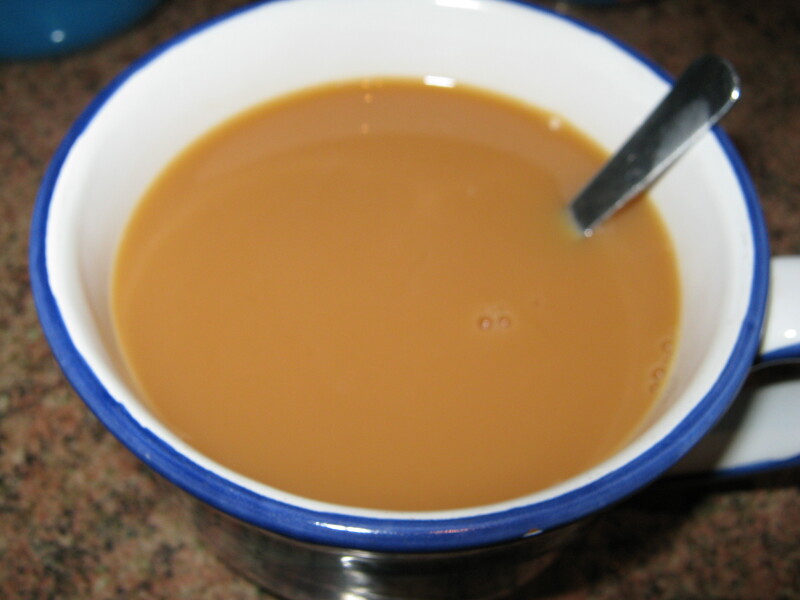 I developed a taste for Ceylon first and would have Orange Pekoe. But ceylon is a very mild black tea and it became too light for me after a while. In fact, I can’t drink it at all these days. Which is a bit of a shame since I feel quite nostaglic now when I see ceylon tea. But I turned away from it and moved onto English Breakfast for a while and then to Assam. If my relationship with tea was a love affair then assam would pretty much be my tea life partner since I’ve spent the majority of life drinking it and blends of it. Assam is variously described as a rich, full bodied tea. It was all I would drink up to about six years ago. I had begun exchanging emails with Clara Parkes of Knitter’s Review and we began a yarn exchange. I asked if there was anything else that she’d like from the UK. Yes, she’d like some Marks and Spencer Extra Strong Tea Bags. I’d never heard of them before and certainly had never tried them but when I picked some for her I got some for me too. They were very strong, stronger than anything I’d drunk before. They were a blend of Assam and Kenyan teas and they grew on me. Nowadays I rarely enjoy anything else. In fact I’m so finicky about my tea that I rarely drink it away from home. Of course I have a stash of tea at Doug’s so I drink it there. But with rare exceptions very few places make tea that’s strong enough for me. Even greasy spoons where you’d assume builders tea would be the average can produce some surprisingly insipid mugs of tea. Almost on a par with the vile stuff that’s served on trains. Urgh! I don’t just drink black teas, I also like some green and white tea blends. I recently ordered some jasmine pearls. These are whole green tea leaves rolled up with jasmine flowers. I’d previously bought some during my last trip to Berkeley but that was over three years ago, so I was keen to get some that were fresher. I ended up ordering some from TeaPigs as well as some of their chocolate flake tea (an assam blend with chocolate shavings) and some honey bush roobios tea temples. Tea temples are what they call their special tea bags. They use whole leaf tea and after trying it I couldn’t help but wonder if I could find a whole leaf tea that was better than the M&S extra strong. It would mean brewing tea the old fashioned way in one of my tea pots, they’ve sadly neglected since I became hooked on the one cup tea bags of the extra strong. My third version of the Rollin’ Beret is about half way done. And it’s not twisted 🙂 Which is fantastic! I now have a long list of beret patterns in my Ravelry library. I also have quite a few yarn ideas for them too. The next one may be from a self striping bamboo mix. The interview went very on Monday. It’s always great fun to talk about my specialist subject 😉 Some people have had problems finding the interview. They moved me up a little so I’m on from about 40 minutes in and am there for 20 minutes. I’ve got to have a look through my stash and see what red yarn I have for knitting my square of the Six Nations Red Scarf. KnitCast was mentioned on the show and I’m always aware that it’s been a quite some time since the last one (Although there was the audioboo from Iknit). I’ve said it before but there will be some editions released this year. They’re unlikely to be monthly but there will be more than one. So, I’ve developed a very recent addiction to knitting berets. The problem is that so far they’ve gone very wrong. 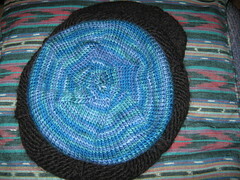 My first Rollin’ Beret from some Fyberspates Scrumptious that Jeni gave me a few years ago, was a joy to knit. That is until I finished it & found that it was more of a hat than a beret. I next cast on, using the same pattern, some Colinette Skye. 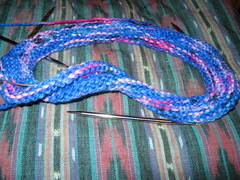 I knit the medium size and was speeding along after the increases when I suddenly realised that my knitting was twisted. There is always a risk of this happening while knitting in the round but it’s still really frustrating. It doesn’t matter how careful I am either after casting on to not twist the stitches while joining the knitting into a circle, it still happens. Happened twice with the first beret. Now I’m deciding what to do next. Frog the silk beret and try again in a larger size? Try again in Skye? I need to be knitting something while on Radio Wales tomorrow morning so I have to decide tonight. Well, since I originally posted this I’ve begun casting on in another Skye colourway. I wasn’t sure if I liked the one that became twisted. Hopefully I can keep this one straight but we’ll see. 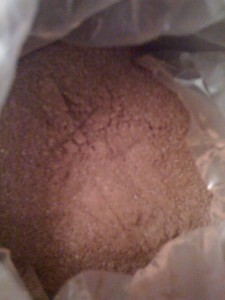 I’d fancied making this vanilla hot chocolate mix ever since I heard about it on Twitter earlier in December. It sounded pretty simple to make. I already had homemade vanilla sugar but not four US cups worth so I only made a quarter of the mix. I also added up both the chocolate quantities into one although I did use two types of chocolate since I had some plain chocolate from a friend for Christmas. The majority of the chocolate I used though was ultra cheap supermarket chocolate and the resulting drink was excellent! The hardest part was grinding down the chocolate. I used my Kenwood food processor and it still took some time. As the recipe calls, I had roughly chopped the chocolate. In the processor I soon ended up with what resembled chocolate boulders. I pulsed and used a variety of the other speeds. The chocolate ground down but it also compacted under the blade so I had to switch it off and break up the compacted bit with a spoon before running the blade again. 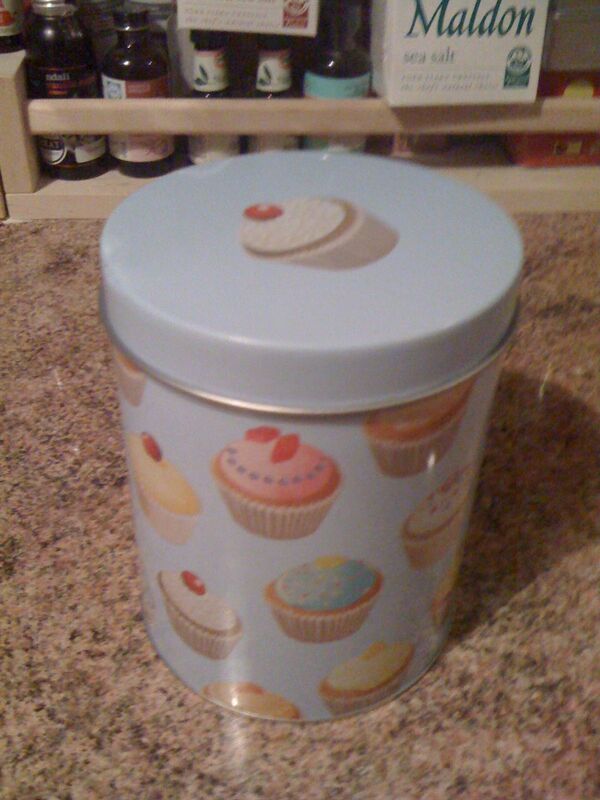 Even making a small amount still filled this large tin. This is part of a set that Doug bought for me some time ago with a fab cup cake design. And this is what the resulting mix looks like. Essentially it looks like something you’d buy in a store. Epicurious suggests using 1/2-1/3 cup with 8 fluid ounces of milk. I opted for the 1/3 and it was very rich. I still can’t believe how good this was considering the cheap chocolate I used. I have now given up on trying to get the photos in this post to centre and to stop the text from going where it shouldn’t! Argh! I used to have this problem with Typepad as well.